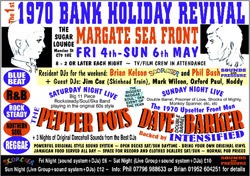 Something a little difference for the May Bank Holiday weekend – the 1970 Bank Holiday Weekender in Margate. Pitched at the "hard mod" scene, it mixes soul/R&B with ska and reggae on the decks over the three nights, along with live acts including reggae legend Dave Barker. All details are now in the events section, along with a large-sized flyer and contact details for weekender.